Cody Ware picked up the 2nd last-place finish of his Monster Energy NASCAR Cup Series career in Sunday’s Axalta Presents the Pocono 400 at the Pocono Raceway when his #51 Clemson Tigers Chevrolet fell out with a vibration after 35 of 160 laps. The finish, which came in Ware’s third series start, was his second of the season and first since his Cup debut at Atlanta this past March, 12 races ago. Following two Truck Series starts where he finished 22nd and 18th for Beaver Motorsports, Ware returned to his family’s Cup team last week at Dover, where the #51 team debuted a new sponsor partnership with local universities. Carrying the logos for the Pirates of East Carolina University, Ware finished 35th, exiting with handling issues after the halfway mark. 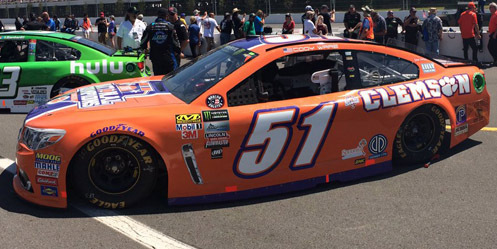 For Sunday’s race at Pocono, as well as the upcoming Southern 500 at Darlington, the #51 would carry the logos of the Clemson Tigers, last year’s NCAA National Champions of collegiate football. Ware was one of 39 drivers entered at Pocono, marking the shortest Cup field at the track since 1991. He ran 38th in Friday’s opening practice, qualified 38th with a lap of 166.334mph, and ran 38th again in Happy Hour. Starting last on Sunday was Derrike Cope, who was making his first Cup start at the track since July 27, 2003. Cope’s Premium Motorsports entry again debuted a new sponsor, this time from StarCom Fiber. Cope was joined at the rear by three drivers: Martin Truex, Jr. for an engine change on his #78 Furniture Row Toyota, Dover last-placer Ricky Stenhouse, Jr. for illegal body modifications made on race day to his #17 Little Hug Fruit Barrels Ford, and Dale Earnhardt, Jr., who lost an engine and transmission with his mistakenly shifted from fourth to second gear in Friday’s practice. By the end of the first lap, however, Ware had fallen to last place, 8.418 seconds behind the leaders. On the sixth circuit, he was more than 20 seconds behind the leaders when Joey Logano made an unscheduled stop for a flat left-rear tire on his #22 Shell / Pennzoil Ford. Six laps later, without the aid of a caution, Logano caught and passed Cope, who had fallen behind Ware as the new 38th-place driver, dropping the veteran to last place. On Lap 14, Cope was the first to be lapped by race leader Kyle Busch. Last place briefly shuffled among different drivers during the first round of green flag stops: Ryan Blaney on Lap 18, Matt DiBenedetto on Lap 19, and Gray Gaulding on Lap 20. By Lap 22, when the stops cycled through, Cope had regained the spot, and was now two laps behind due in a car that was too tight. Ware regained the spot on Lap 31, when he came down pit road for another four-tire stop. According to the team, the previous set of tires were so bad that the car had become nearly impossible to drive. At one point, Ware came on the radio saying “I’m not gonna destroy this car.” The crew looked under the hood on this second stop, then sent him back out on Lap 39, eight laps in arrears. He only stayed on track for a moment, as the crew finally brought him back to the garage, where they worked over “the drive plate, axle, everything.” Unfortunately, they never came back out on track, and FOX listed him out of the race with 13 laps to go in Stage 2. Ware’s left turn into the garage came just minutes before Earnhardt again had issues with his transmission, missing a shift and damaging his engine. If Ware had managed to turn 24 more laps, it would have handed Earnhardt his first last-place finish at Pocono since 2006, and the first-ever last-place run for #88 at the Pocono Raceway. 37th and 36th went to Jimmie Johnson and Jamie McMurray, who both suffered separate brake failures entering Turn 1 on Lap 96, resulting in two hard crashes. Rounding out the Bottom Five was Kasey Kahne, who drew the final caution on Lap 142 when his #5 Farmers Insurance Chevrolet also wrecked in Turn 1. *This marked the first last-place finish for the #51 in a Cup Series race at Pocono since June 13, 2004, when Kevin Lepage’s #51 NegotiationsSeminar.com Chevrolet overheated after 9 laps of the Pocono 500.